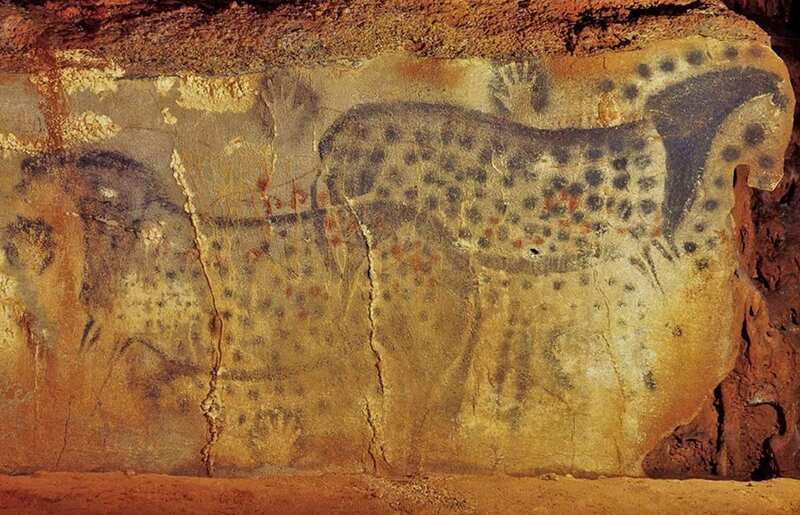 Pech Merle cave is part of a group of 13 adorned caves in Southwest France in the Lot Valley. 29,000 years ago these caves were the art galleries of the time where artists painted frescoes of all sizes on the walls. Forgotten for ages they have been rediscovered during the first half of the 20th century. Pech Merle is the only one still open to the public. Lets discover it before it could be closed for preservation issues like its twelve other sister caves. Described as the Sistine Chapel of prehistory, the Pech Merle cave is a unique set of seven cavities discovered in 1915 by a Parisian medical student. He only found the first room and it was not before 1922 that three local teenagers got to the white room and were the first ones to lay eyes on drawings that had been hidden in the dark for millenniums. In only two years a road was built, a flight of steps carved out of solid rock and guides hired to welcome visitors in 1924. Today to preserve the site only 700 people are allowed to visit the cave each day. In high season, online booking is highly recommended. Guided tours of 25 people (including English speaking tours) are organised all day long. The visit begins in a tunnel dug through a mass of fallen rocks that blocked the entrance 10,000 years ago. It gives access to a large cavity where bears’ and hyenas’ bones have been found but most of all you’ll notice the long roots of an oak that hang from the high ceiling before reaching solid ground again to do their root’s job! After the visit go to the garden that surrounds the entrance to the cave and you will see this oak (marked with a big white question mark) looking perfectly all right above this big cavity. In the next cavity the prehistoric “art gallery” now opens. 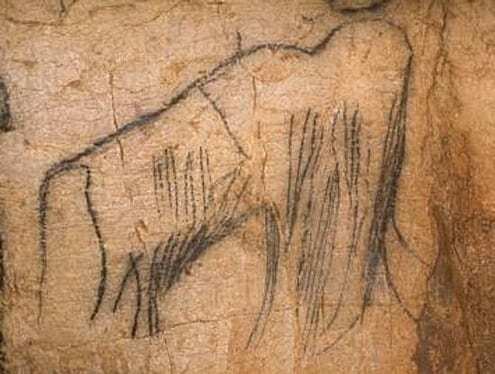 A 7 metres long and 25,000 years old fresco representing amazingly beautiful horses, buffalos, mammoths and aurochs has been drawn on one wall. 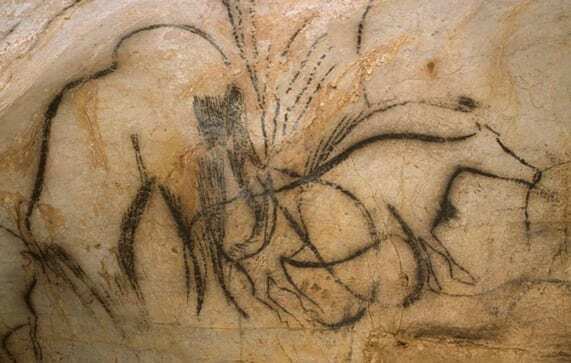 Soon after you’ll discover the cave masterpiece, a set of two horses drawn with points of black “paint” 29,000 years ago. It feels wonderful to feel connected with our distant ancestors through a form of art that we are still able to admire and feel close to. From cavities to cavities the visit continues allowing you to discover hundreds of drawings representing bears, fish, deer, ibex, feline, other horses, mammoths and buffalos, male and female human figures and hands as well as mysterious geometrical patterns. 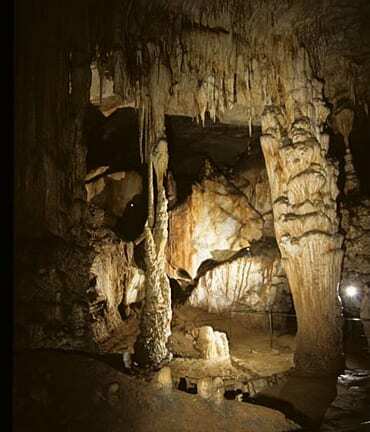 Other cavities are filled with geological formations such as stalactites and stalagmites, earth-made stacks of plates and rare cave pearls. The one-hour tour seems to end to soon but you can extend your visit in the close by museum to learn more about the life of men and women who made these extraordinary drawings. 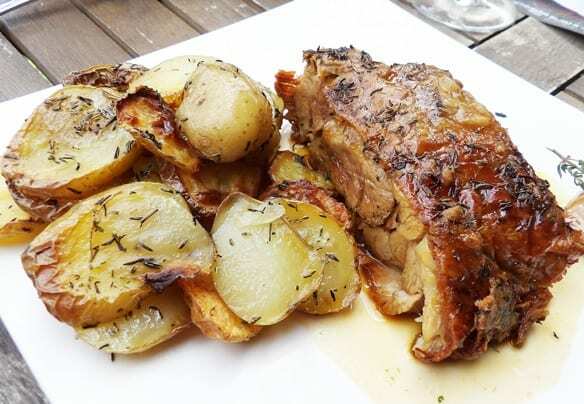 In the close by Cabrerets village the “Hotel des Grottes” is a family house that welcomes tourists, hikers and pilgrims since a hundred years or so. Marthe David one of the three teenagers who discovered the Pech Merle cave, founded a small guesthouse with her husband in the 1920’s. Today the fourth generation is in charge. Nicolas and Clelia Theron have completely renovated the hotel that offers simple and comfortable rooms. 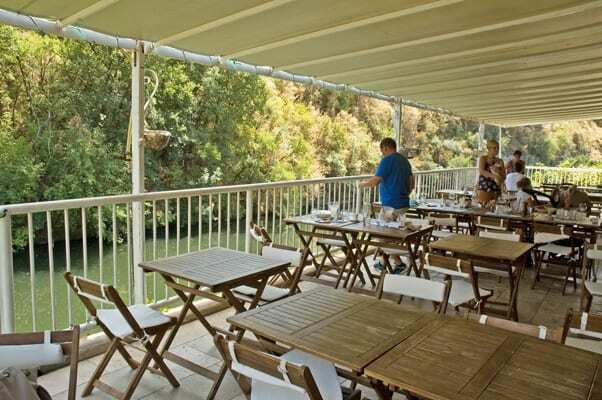 In summer time breakfast, lunch and dinner are served on the outside terraces that overlook the Célé River. 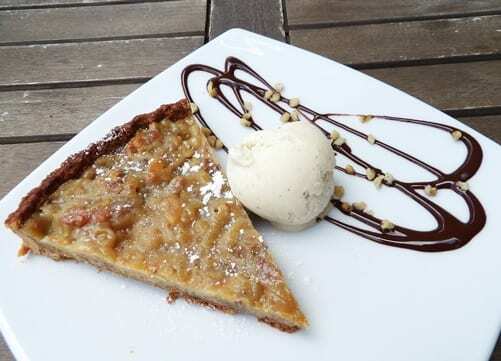 The different menus propose regional recipes made with local produce. 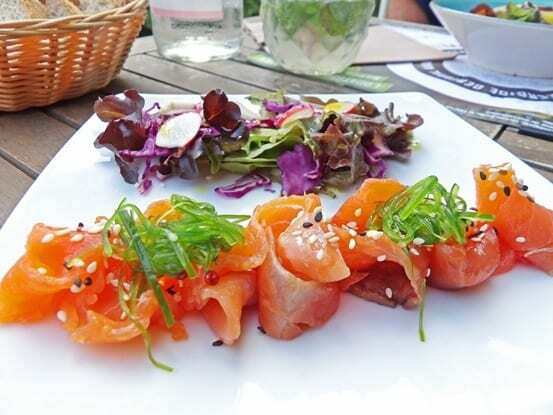 Traditional smoked trout, bell pepper and tomato crumble, foie gras, tasty 7-hours lamb confit from Quercy , duck burger, truffle omelette, sweetbread as well as desserts such as the caramel and walnut tart or the poached pear in almond milk are all home made by the chef. 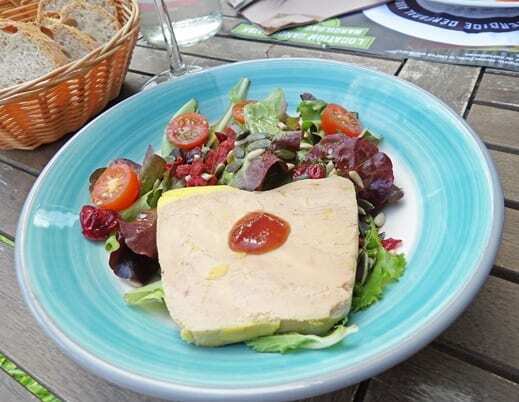 A tasty meal in a relaxing setting! Who could ask for more?